COLTELLO SPORT CHIUDIBILE SCARPERIA INOX CM.10 MANICO NYLON,PESO 118 Gr. LUNGHEZZA TOTALE 225,00 MM. LUNGHEZZA LAMA 100,0 MM. SPESSORE LAMA 2,00 MM. ALTEZZA LAMA 23,40 MM. ACCIAIO AISI 420 DUREZZA HRC 54. COLTELLO SPORT CHIUDIBILE ZUAVO INOX CM. 8,5 FINTO CORNO PESO 80 Gr. LUNGHEZZA TOTALE 190,00 MM. LUNGHEZZA LAMA 85,00 MM . SPESSORE LAMA 2,00 MM. ALTEZZA LAMA 17,50 MM. ACCIAIO AISI 420 DUREZZA HRC 54. COLTELLO DA CACCIA CON MANICO IN LEGNO PESO 130 Gr. LUNGHEZZA TOTALE 215,00 MM. LUNGHEZZA LAMA 90,00 MM. SPESSORE LAMA 3,00 MM. ALTEZZA LAMA 20,50 MM. ACCIAIO SANDVICK 12427 DUREZZA HRC 56-58. 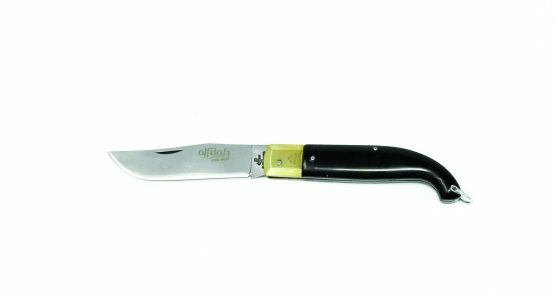 COLTELLO SPORT CHIUDIBILE SCARPERIA INOX CM 7,5 MANICO OLIVO PESO 80 Gr. LUNGHEZZA TOTALE 175,00 MM. LUNGHEZZA LAMA 75,00 MM. SPESSORE LAMA 2,00 MM. ALTEZZA LAMA 19,10 MM. ACCIAIO AISI 420 DUREZZA HRC 54. COLTELLO SPORT CM. 11 MANICO CERVO CON FODERO. PESO 185 Gr. LUNGHEZZA TOTALE 210,00 MM. LUNGHEZZA LAMA 110,00 MM. SPESSORE LAMA 4,5 MM. ALTEZZA LAMA 25,00 MM. ACCIAIO INOX AISI 420 DUREZZA HRC 54. COLTELLO SPORT CHIUDIBILE SCARPERIA INOX CM. 10 MANICO OLIVO PESO 115 Gr. LUNGHEZZA TOTALE 225,00 MM. LUNGHEZZA LAMA 100,00 MM. SPESSORE LAMA 2,00 MM. ALTEZZA LAMA 28,00 MM. ACCIAIO AISI 420 DUREZZA HRC 54. COLTELLO DA CACCIA A LAMA LARGA CON MANICO IN LEGNO. PESO 160 Gr. LUNGHEZZA TOTALE 220,00 MM. LUNGHEZZA LAMA 110,00 MM. SPESSORE LAMA 4,00 MM. ALTEZZA LAMA 26,9 MM. ACCIAIO AISI N690C DUREZZA HRC 58-60. COLTELLO SPORT CHIUDIBILE PATTADA INOX CM. 11,5 MANICO OLIVO PESO 120 Gr. LUNGHEZZA TOTALE 255,00 MM. LUNGHEZZA LAMA 115,00 MM. SPESSORE LAMA 2,20 MM. ALTEZZA LAMA 20,50 MM. ACCIAIO AISI 420 DUREZZA HRC 54.